In order to use this tutorial, you will need to have a comprehensive understanding of the interfaces of The GIMP and Blender, as well as having both those programs. They are available online and can be freely downloaded from their respective websites. You should have worked with both of these programs before, and have a good understanding of their fundamental features. You could also use other comparable 2d, and 3d programs. 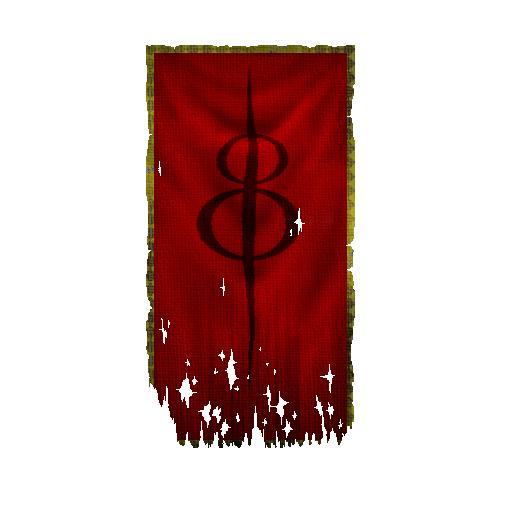 During this tutorial you will learn how to make nice cloth banners, but you also learn the basics of layer masks, blend modes, and other effects. Set up your work space with a transparent 512 by 512 texture. 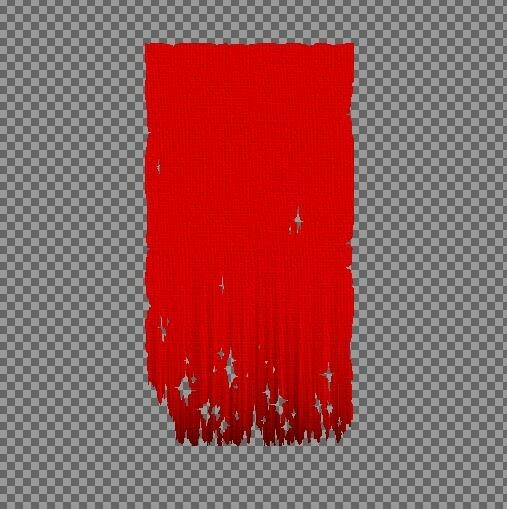 When creating textures for real-time content, always use a power of 2 (2, 16, 32, 64, 128, 256, 512, 1024, 2048, 4096, etc.). This is because, if your texture is not of appropriate dimensions, your computer will have to scale the texture up in it's memory in real-time, slowing your overall framerate. With your new image, using the rectangular selection tool, and the fill tool, create a rectangle of your desired color, like so. Now that we have our general shape and color, we're going to use a mask to make it ripped and torn. A mask is basically something you draw onto your image that obscures parts of it. When the mask is drawn on, it takes the black and white value of it (basically what shade of gray it is), and makes your original image transparent based on that value. The darker it is, the more transparent, whereas lighter it becomes more opaque. Black completely obscures your image, and white lets it show. 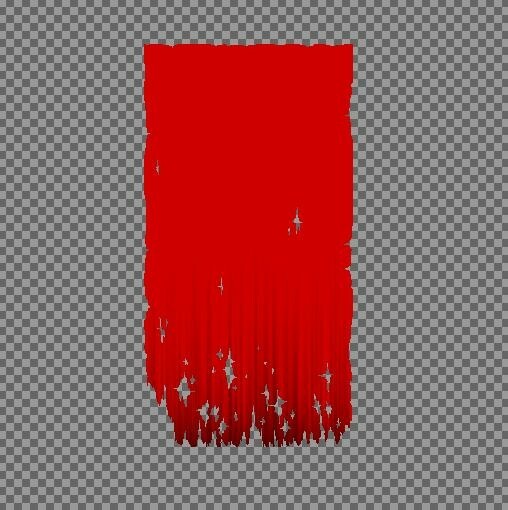 This can be done normally by just using the eraser tool at varied opacities, but the reason that masks are used is that they are completely non-destructive to the layer they effect. To create a mask right-click on the layer (in the layer dialogue), and select "Add Layer Mask", and then select "White-Full Opacity"from the menu. Select a pure black brush, and begin drawing around the edges to make them appear tattered. Keep in mind that most of the wear will be at the bottom of the fabric. 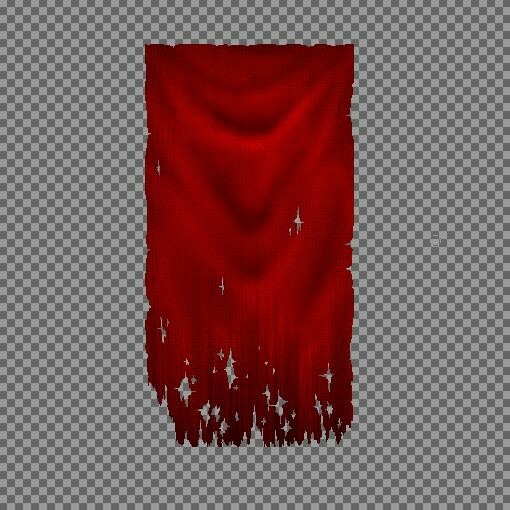 Keep in mind also that fabric has a grain to it, so the rips will most likely end up being horizontal and vertical only. Your final product should look something like this. Note that when using masks, you can toggle the visibility of the mask with Ctrl+LMB to make it visible or invisible, and you can use Atl+LMB to show it above the layer it's actually affecting. Now we're going to add a little grime to the bottom of it. Create a new layer, and make a thick black line at the base of the flag, then rotate your layer (Layer>Transform>Rotate). Once it's rotated, use the wind filter (Filter>Distorts>Wind) at high strength. Finally, blur the result of that filter (Filter>Blur>Blur), and rotate it back to it's original position. I also added this to the top of the tapestry. To add some grain to the fabric to make it look a little more like fabric, we're going to create a new layer and fill it with a neutral gray. 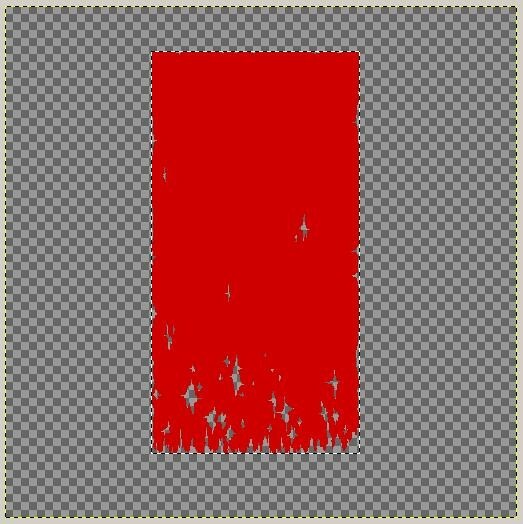 With this new layer selected, and a canvas to it (Filter>Artistic>Apply Canvas), with a depth of about 20. Set this layer's blend mode to Overlay, and adjust the opacity to your liking (about 50). You should end up with something like this. From here, we need to make our image look like cloth and add the wrinkles and folds that are necessary to make it look like cloth. This is by far the most difficult part, since it will rely on your understanding of the way that fabric drapes, as well as the lighting of the fabric. It's also fairly difficult to do with a mouse, so you'll be better off with a tablet. First off, start with new layer, filled with a neutral gray color, I set all my RGB values to 174 to get my base. 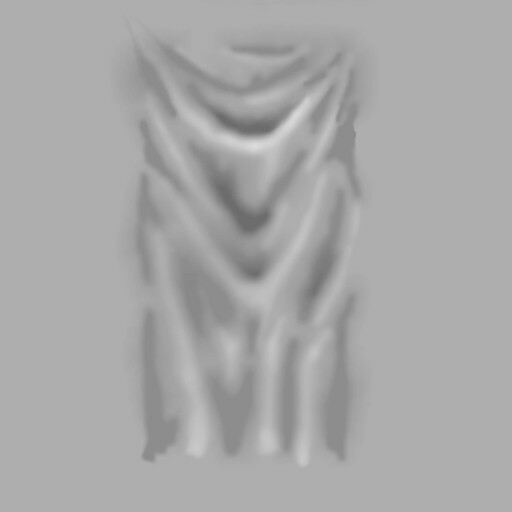 Before we start making the actual folds, we'll have to look at how cloth will actually drape in this case. For this banner, we'll assume that it's being held at the top two corners. Using this model, select your dodge and burn tool, begin with dodging the light highlights along the tops of some of the folds, and then proceed to burn the lower part of the folds as well as directly above fold. Once finished, adjust contrast, and blur it (using the tool rather than the filter). When you blur it, blur the wider, lower parts more than the smaller wrinkles at the top. Here's the result. Set this to multiply over your base layer. It should look something like this. Now to add to the flag, we'll need an interesting design. 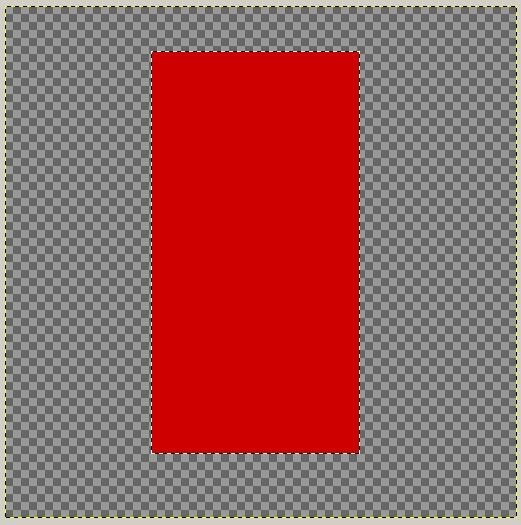 I made mine in Blender, rendered it on a white background, then alphaed out the white when I opened it in the GIMP. To make it work a little bit better, I rotated it 90 degrees and used the Curve Bend Filter (Filters>Distorts>Curve Bend) to make it look a little warped. I then applied it to my other layers with the Grain Merge blend mode. It ended up looking like this. Add any sort of border, and you're done. I did mine by creating a selection where I wanted the border, and filling it with a gradient, and coloring the gradient. I then, on another layer used the (Filters>Render>Pattern>Checkerboard) filter, and then rotated it 45 degrees with the rotation tool. With only the gradient and pattern layers visible, I set the pattern's blend mode to overlay, and merged the two layers. Here's my final result. Website design by Tony "blendenzo" DiRienzo. All content is copyrighted by its respective author.